One day I decided to see if I could come up with a way to make a slope with an even edge. Most of the slopes I’ve seen have a bit of a jog in them, but I wanted one as smooth as I could get it. After playing around for a bit, I came up with a cross between Tunisian and regular crochet. Even if you’ve never done Tunisian, you can do this. I have provided step by step, well, actually loop by loop instructions. I used a regular crochet hook to do this scarf. It looks great in light weight yarns and super bulky. Just make sure to adjust your hook accordingly. 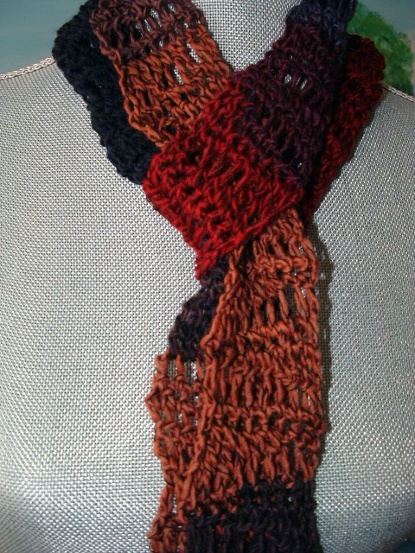 The Ziggety Scarf is a simple three row repeat that can be worked to any length. It is a great little accessory to add a touch of color to a summer tank, belted in jeans, or wrapped around your head to keep it out of your face. It looks great in solid, semi-solid, and self striping yarn. 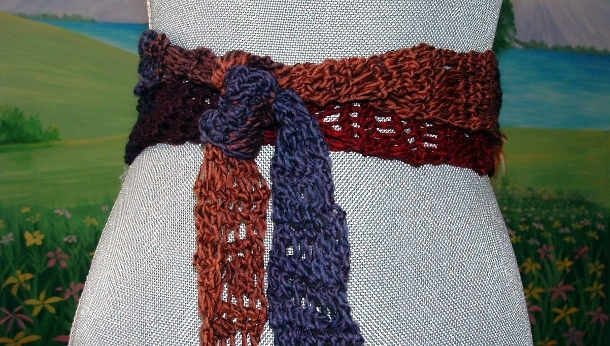 It is also a great stash buster since it only uses a small amount of yarn to make a long scarf! Note: This pattern can be worked to any size with any hook and yarn combination. Blocking is optional. Foundation: Ch 10. Sc in second ch from hook and in each remaining ch. (9sc) Turn. Row 1: Ch2, *yarn over twice (like a treble crochet) insert hook into next stitch, and draw yarn through the stitch, yarn over and draw through 2 loops, yarn over and draw through 2 loops* repeat * to * once more (3 loops on hook). **Yarn over and insert hook into next stitch, draw yarn through the stitch, yarn over and draw yarn through 2 loops. ** Work ** to ** twice more (6 loops on hook). ***Yarn over, insert hook into next stitch and draw yarn through stitch and loop. *** Work *** to ** twice more (9 loops on hook). Do not turn. Row 2: (return row) Yarn over and draw through 1 loop, * yarn over and draw through two loops. Repeat * to * to end of row. Do not turn. created by last row. (1 ch, 8 sc) Turn. ** twice more (9 loops on hook). Do not turn. loops. Repeat * to * to end of row; do not turn. created by last row (1 ch, 8 sc). Turn. Continue repeating row 4-6 to desired length. Finishing: Weave in ends, block if desired. I’m a stay-at-home mom that uses designing as a way to keep my self sane. With a toddler, that is all I can ask for. I enjoy the challenge of putting things together in a pleasing way and hope that others find them pleasing as well!